This course builds on the content of the Industrial Rescue User course to provide more in-depth experience of different rescue situations and competence in thorough inspection of the equipment as required by legislation. Provides knowledge of a full range industrial rescue skills together with experience of varied rescue situations. This course is intended for rescue teams or emergency team members of industrial rescue teams, who may be required to deal with a wide range of emergency situations. Industrial Rescue – RescuePack Advanced course is for rescue teams or emergency team members from any industrial environment who wish to advance their user skills to operate in more complex rescue situations. 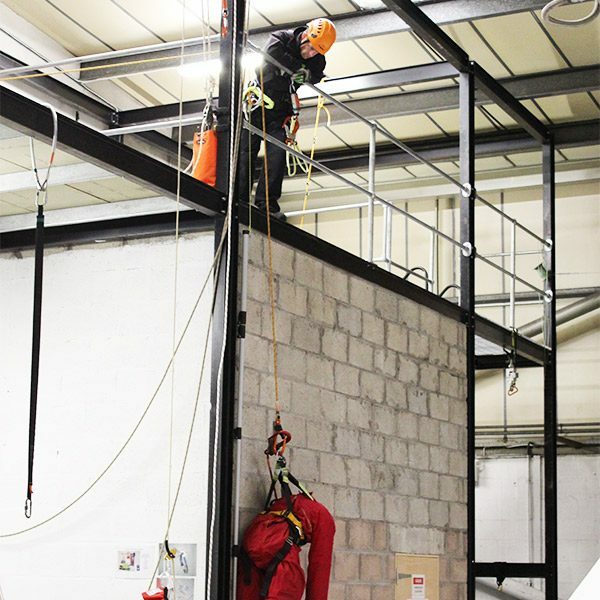 This Industrial Rescue course teaches techniques to turn heightec’s RescuePack into a small rope rescue capability. Contains exercises in rescue management, casualty assessment and casualty handling. Use of tensioned tagline for additional control during lowering or raising. Also covered in this course is complex rigging and more versatile uses of stretchers. These systems also provide the capability for access and rescue from confined spaces. Supervisors are assessed on their ability to correctly specify the correct rescue procedure for different locations, including requirements for personal safety of rescuers. Methods of thorough inspection including marking, traceability, certification and record keeping. Arranged for groups only. Please call for details. Candidates must have completed RescuePack User. Minimum age 18. Must be fluent in English.